Windsor Hills - Congratulations on your choice of resorts!!! Windsor Hills will impress you! 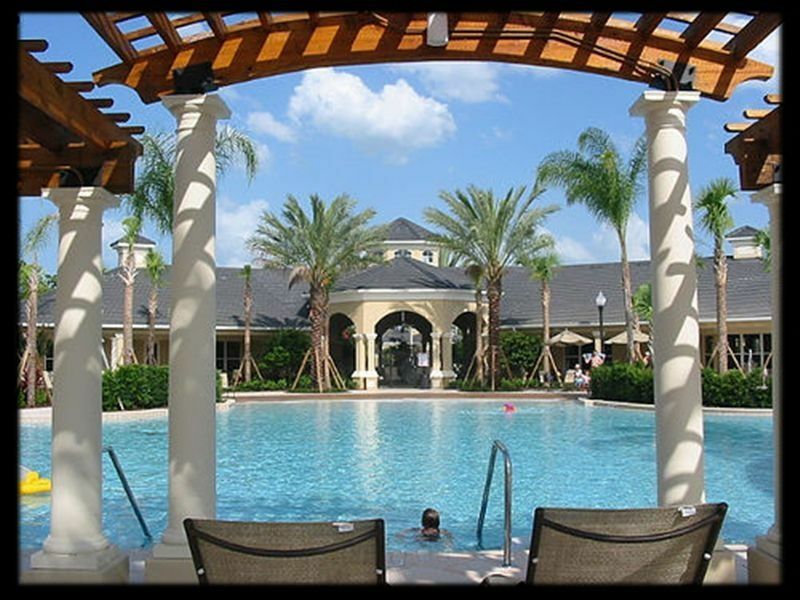 It is the newest, finest, most enjoyable community in Kissimmee! The amenities are just awesome for kids and adults alike. They include a gigantic pool with beach entry, a jacuzzi, a water slide, a kid’s water-chute play area as well as a castle-themed playground not found anywhere else. The clubhouse has a state-of-the-art surround theater that seats up to 58. The wide selection of movie favorites can be reserved by guests for showing at any time. It also has a superb fitness center plus pool and ping-pong tables for your enjoyment. There is, for your convenience, a well-stocked sundry shop offering snacks, sodas, grocery, swimming and gift items. The clubhouse daily operating hours extend through 10pm. The community is gated with 24 hour security. It is beautifully landscaped. The comfort of this impeccably clean 3 bedroom, 2 bath unit (over 1300 sf) cannot be surpassed by any hotel accommodation. The master suite has a king-size bed with its private bathroom. The 2nd bedroom has a king-size bed and the 3rd bedroom has two twin beds, both sharing a very spacious second bathroom. Both bathrooms have wall-attached hair dryers and hand-held shower heads. There is a TV and a ceiling fan in each bedroom and living room. The TV in the living room has a built-in DVD/VCR; the ones in the two kings have a built-in DVD; the one in the 2 twins has a built-in VCR. The kitchen is fully equipped with full-size appliances including refrigerator, stove, microwave, dishwasher, and all the equipment for cooking for the family if you so desire. There is also a utility area in the unit with brand new washer/dryer. The unit is on the first floor so you don't have to bother with elevators and it is steps away from the clubhouse. You can walk to the clubhouse through the back of the building without crossing any streets (very safe for kids). The rates offered are 30-40% below comparable rental agent rates. The commission savings have been passed on to you!!! I am an original owner. I bought this condo during pre-construction. I intend to continue to hold this property long-term. It is a great place to relax and spend quality time with your family and friends. It has high-end amenities such as the 58 seat private theater that you can reserve without cost. The ambience is easy-going and friendly. We enjoyed our stay and had a few issues, not necessarily with the condo itself, but with Windsor Hills in general. I had a couple of minor issues with the condo, but not a big deal. The location is wonderful. First floor unit was easy to load/unload, but was noisy at times. There doesn't seem to be enough parking for the amount of townhouses. Come in late and you're parking at the next building over. The pool is not as large as it looks and was always packed, never enough chairs or tables. If you have young kids or teens, the NEW water slides looked fun. We didn't get the chance to use the pool-hot tub until the last couple of days of our vacation, our schedule was quite busy. I would rent from Margie again, maybe a different time of the year. Great place close to parks. My kids loved the pool and slide. Would recommend ages 6-12. Great time! We've stayed in Windsor Hills numerous times before but in the homes. This time we had a much smaller group of 6 people and Margie's condo was perfect for our family vacation to Disney. There was plenty of space and it was well appointed. We enjoyed having two king size beds for the adults and the kids loved sharing a room. The new slides and play space at the pool were fantastic and having the pool just steps away was what we needed after long hot days at the parks. We were able to use Walmart to order groceries ahead of time and just pick them up on our first morning which saved us time and energy. It's just a quick trip up the street. I've already recommended this unit to multiple friends who travel to Disney. Thank you again Margie for the magical stay!! Stayed here with a party of 5, two adults, 3 kids ages 15, 10 & 4. We've stayed in Windsor Hills before, so we knew it was a great community. But this unit is owner managed, and it showed! Nice having 2 kings. And great having the little things there on our arrival, like trash bags, paper products etc... most places don't do that. The beds were quite comfortable, and newer washer and dryer is a plus. The toaster wasn't really working properly, but we didn't report it as it wasn't a big deal to us, but judging from the way the place is cared for, I'm sure the owner will take care of it off this review! Our next trip is in Feb. If we have the same group going will try to book it again for sure!! So much better than the last time we stayed at Windsor Hills, and this was a smaller unit (3/2 compared to a 4/3)! The difference being the care an owner brings to the table. Very happy and satisfied. A lot better than staying at a hotel. Very close to all attractions and groceries. We will be back for sure. Daily rates for reg season available (1/7 of weekly rate) Discounts during regular season for last minute availability and longer stays Credit card payments are processed via paypal (4% fee from paypal is additional). Payment terms and additional photos are furnished upon request.